Purr Tasty Cat Treats with Hairball Control are a complementary pet food designed to be fed as a treat or reward between meal times. Formulated with natural cellulose to help combat the formation of hairballs, the treats also contain chelated minerals from an organic source for superior absorption into the body, and added natural antioxidants for overall health and wellbeing. 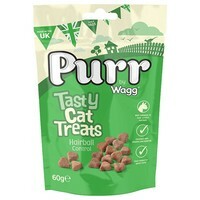 Purr Tasty Treats also contain added Taurine to help support a healthy heart and eyes.